Novomatic Casino have outdone themselves with this slot machine, so much so that playing Cindereela will make you feel as if this classic fairy tale has come to life! With all the familiar characters gracing your screen in symbol form, such as: the pumpkin, the mice, the dog, the fairy godmother, Prince Charming, the Princess’s slippers and the Princess herself, you’ll want to keeping playing this slot ‘til way after midnight! Come and see for yourself, and let the magical music take you to the land of fairy tales, where you don’t need to put on a pretty dress to enjoy the party! There’s no need for you to be a slots expert, or even a fairy tale fanatic, for you to enjoy this simple and entertaining slot game. It’s easy for you to change your bet: all you have to do it use the plus and minus symbols, located at the bottom of the screen, in the middle. To the left, you’ll be able to see how much cash you have and, to the right, you’ll be able to see the amount of your previous win. If at any point, you need to consult the paytable, you can do so by clicking on the ‘paytable’ and ‘more info’ buttons. Like most NovomaticCasino.co.uk slots, you can play for free to get an idea of the game but once you’ve got the hang of it – there’s no need for you to keep clicking, just set your bet and click ‘autostart’ and let the game play for you! Players of Spinderella and Magic Princess will enjoy this slot without a doubt. In Cindereela, there are many fairy tale symbols which pay out; if you get three or more matching symbols in successive reels, from the first on the left to the right, you’ll be filling your fairy-tale pot of gold. The paying symbols include: the dog, the slippers, the mice, the pumpkin, Prince Charming and the Princess herself. The Princess Cinderella is the highest-paying symbol and she is also the Wild symbol, and she can substitute for any symbol except the Scatter symbol. Although Prince Charming is a high-paying symbol, in this fairy-tale land it’s the Princess who’s worth more! Watch the Fairy Godmother Wave Her Magic Wand! In the story of Cinderella, it’s the Fairy Godmother who shows up to help at just the right moment: she helps the Princess get ready for the ball and sends her off in style. 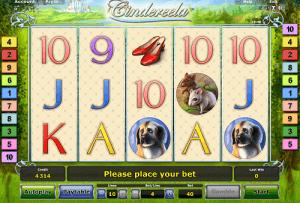 In Cindereela, one of NovomaticCasino.co.uk’s most enchanting slot games, she miraculously appears out of nowhere, but her wand doesn’t give you a makeover, her wand gives you free spins! Spin three or more of her to win up to 30 free spins and watch as the free spins trigger even more magic. The spell she casts transforms this fairy-tale slot and its symbols into something altogether more elegant and generous – for, during this bonus game, your winnings will be double!